I’m not sure who gets more excited when Brio parcels arrive – me or the boys. Brio has come such a long way since I was little and this particular Brio just blew my boys’ hair back. This week we’ve been playing on Instagram stories with the new Brio Remote Control Travel Train. We’ve played with Smart Tech before and loved it, but this train is something else. 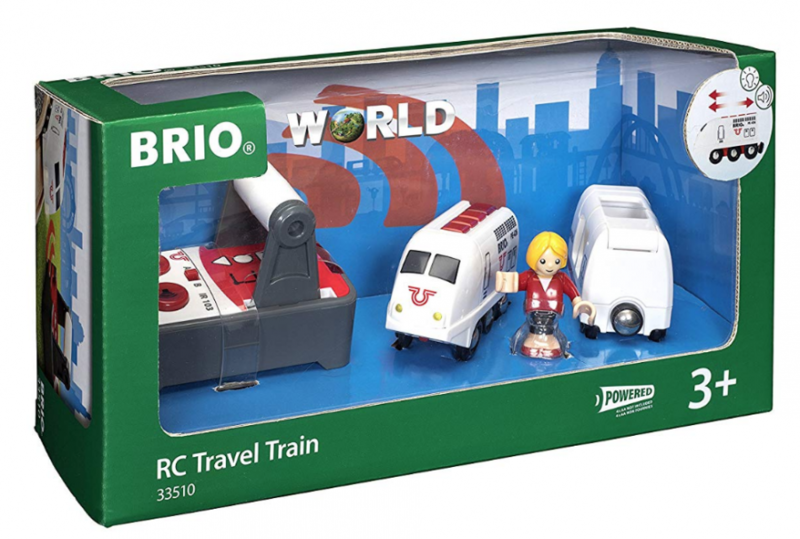 If you’re shopping for the Brio Remote Control Travel Train, the box looks like this, and the number is 33510. It retails at around £30. 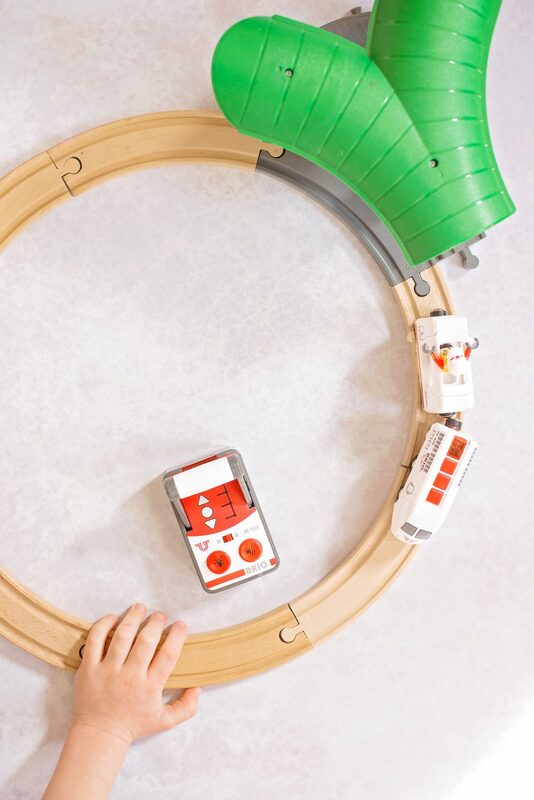 At first glance, it looks just like any other Brio train – there are four pieces in the box; a remote control, Brio person, train and carriage. Very simply, thank heavens – we all know that I’m quite useless with big instructions and the boys hate having to wait for Gav to come home and help, so I was rather proud of myself this time! 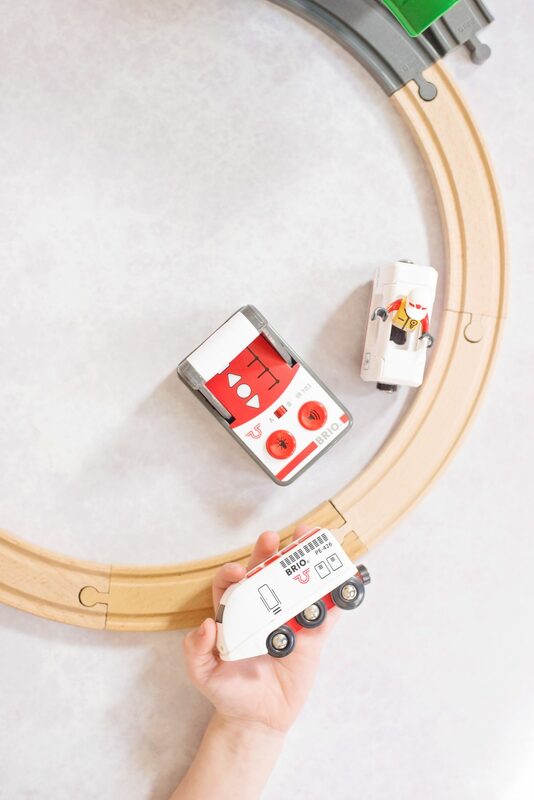 The train is suitable for 3 years and up, and you need to remember to add 4 AA batteries [two for the remote control and two for the train’s engine] to your shopping basket when you buy! There are two ways to play with the train – you can either use the remote control or press the buttons which are square on the top of the train. What’s amazing about the set is that after a few minutes of not being played with, it shuts off to avoid wasting battery power [hooray!] This means that if your delightful child should steer the train somewhere you cannot see at tidy up time, it’s going to be good to go when you eventually find it. Something we felt we should point out to avoid any frustration in using the set is to make sure that the remote control and train are both on the same channel – A or B – and that I think the remote is infra red and so you need to be pointing it at the train to use this instead of the buttons. So, how did it do? As you all know, the poor people of Brio land in our home are merely staff in Brio land and the Lego characters are the stars of the trains. The boys decided this was the new Hogwarts’ Express and Harry and friends were transported about the track. We managed to get our little train to pull two carriages of Lego figures safely. 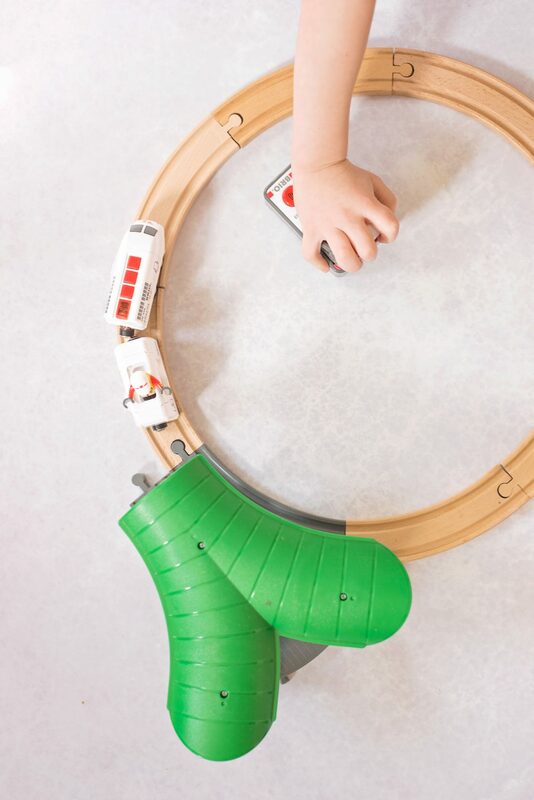 The Brio Remote Control Travel Train is the BEST piece of Brio fun we have had in ages. We love Brio anyway, but this is amazing and has been played with constantly. Thank you Brio! 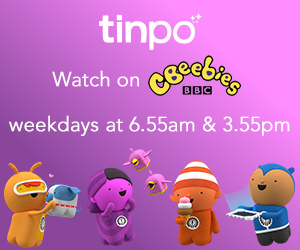 « HAVE YOU MET THE TWISTY PETZ?